Egyptian goddess whose function is not completely clear. She is the daughter of Atum and the sister of Shu. Her children are Geb and Nut. She is called the goddess of moisture, based on the fact that creation myths tell that she was created by Atum spitting her out. The same is also true of Shu, however. It thus appears that her most important role was that of Shu's partner. In Egyptian mythology there are many beings that appear to have been created to satisfy the Egyptian's need to have pairs. Besides Nephthys, the rather colourless pendant of Isis, the female gods from the Hermopolitan Ogdoad are examples of this. Tefnut does indeed usually appear in company with Shu. Their link was so close that in the Roman period they became the Twins in the zodiac. As early as the Pyramid Texts from the Old Kingdom, Shu and Tefnut are mentioned as a lion pair. 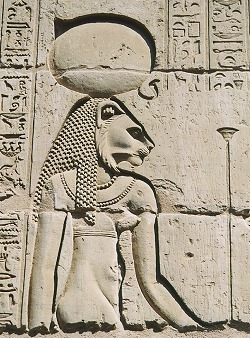 It is mainly Tefnut who is often shown as a lioness later on. Egyptian mythology has various stories about the search of a god for a lioness. For example, the gods of This, Onuris and Mehyt have such a tale. Shu and Tefnut were also regarded as the eyes of the sky falcon, with Shu usually the sun and Tefnut the moon. But Tefnut could also be the sun eye, who spits fire, annihilating her enemies and who in other versions of the myth is considered to be the uraeus. From there it was only a small step to associating her with the eye of the sun who is far away from her lord and who has taken on the form of a bloodthirsty lioness; Shu and Thoth were then sent after her to fetch her back. This contradictory nature meant that Tefnut was compared with both the angry lioness Sakhmet and the friendly cat Bastet.